The myocardium is the target of toxicity for a number of drugs. Based on pharmacological evidence, cellular targets for drugs that produce adverse reactions can be categorized into a number of sites that include the cell membrane-bound receptors, the second messenger system, ionic channels, ionic pumps, and intracellular organelles. Additionally, interference with the neuronal input to the heart can also present a global site where adverse drug effects can manifest themselves. Simply, a drug can interfere with the normal cardiac action by modifying an ion channel function at the plasma membrane level leading to abnormal repolarization and/or depolarization of the heart cells thus precipitating a disruption in the rhythm and causing dysfunction in contractions and/or relaxations of myocytes. 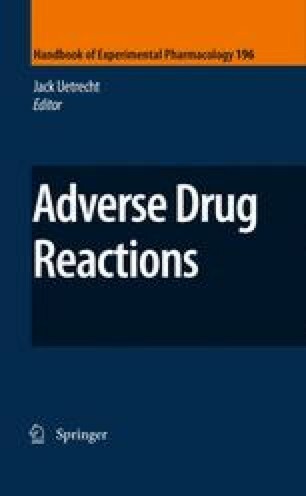 It is now recognized that toxic actions of drugs against the myocardium are not exclusive to the antitumor or the so-called cardiac drugs, and many other drugs with diverse chemical structures, such as antimicrobial, antimalarial, antihistamines, psychiatric, and gastrointestinal medications, seem to be capable of severely compromising myocardium function. At present, great emphasis in terms of drug safety is being placed on the interaction of many classes of drugs with the hERG potassium channel in cardiac tissue. The interest in the latter channel stems from the simplified view that drugs that block the hERG potassium channel cause prolongation of the QT interval, and this can cause life-threatening cardiac arrhythmias. Based on the evidence in the current literature, this concept does not seem to always hold true.